1965-70 Mustang Coupe and Convertible Trunk Lid Weatherstrip. 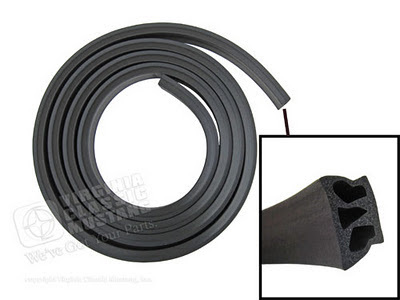 The Weatherstrip that is used on the trunk door on a Mustang may seem like a simple item, but it is quite important. Number one is the fact that virtually every single Mustang needs this part replaced during restoration. We have a complete line of 1964 1/2-73 Mustang Trunk WS. We just added a new one to our inventory that does not even appear in our brand new 2012 Mustang Parts and Accessories Print Catalog. 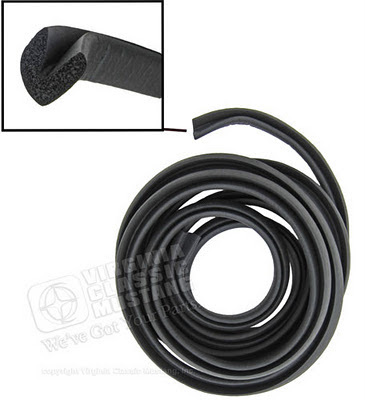 This one is the new WS-191 1964 1/2-70 Mustang Trunk Lid Weatherstrip for the Coupe and Convertible-Made in USA. This one gives you an alternative to our WS-19 Imported version of this same Mustang trunk weatherstrip. It is more pliable than the imported version. 1969-70 Mustang Fastback Trunk Lid Weatherstrip. While we are on the subject of trunk weatherstripping, we will mention that all of our trunk weatherstripping images have been updated on our web site. We will also mention that all of the others are Made in the USA. The images show the correct cross-section of each part. This way you get the proper seal along with the correct authenticity.